Architects design space for form, function, aesthetics and sustainability. Trends in modern architecture include integrating modern features such as steel doors and windows that match homeowner’s individual taste. Incorporating a steel French door into a contemporary home – whether connecting an outdoor living area or creating a stunning balcony – enhances the appearance with modern elegance. Whether a home or commercial property is modern or traditional in design, steel windows and doors are a stunning addition to the aesthetic. Clean geometric designs with minimum sight lines maximize available light. A range of finishes, from bronze to black, charcoal and pewter, steel windows and doors complement any exterior elevation – stone, stucco, cement or wood siding. Steel French doors offered by Portella Iron Doors are superior in design and durability, manufactured from hot-rolled steel, including a continuous steel mounting/ flashing flange of 1/4″ x 3″ for structural integrity and weatherproofing. Steel doors and windows are an ideal choice for home additions and remodeling projects. In addition to creating a striking modern look, they open up the space with thin profile narrow sight lines. Design elements such as steel windows and doors in elegant commercial properties create a clean spacious feeling of luxury by maximizing light and opening up the space with minimal sight lines. Interiors are enhanced with a bi-fold steel door connecting spaces or a spectacular entrance to a conference room featuring steel French doors. Portella Iron Doors designs and manufacturers the highest quality steel windows and doors and guarantees their products with a 10-year warranty. The Architect Series of hot rolled steel doors and windows come standard with low emission Argon-filled insulated glass for ease of cleaning and durability. 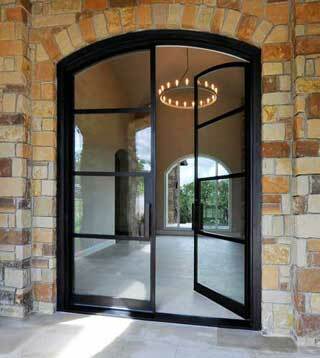 Portella Custom Steel Doors and Windows is a member of the American Institute of Architects. ©2019 Portella Custom Steel Doors and Windows. All rights reserved.